Looking for a budget break close to Sydney? Camp by the shores of the Hawkesbury River at Cattai campground or enjoy waterside fun and plenty of facilities at Bents Basin. Located near Sydney’s Northern Beaches, The Basin campground is just the place to pitch your tent surrounded by beach, lagoon, bushwalks and wildlife. With special offers available, now's the perfect time to book your getaway and discover the beauty of camping close to Sydney. Campsites at Euroka campground in the Blue Mountains are popular with both campers and kangaroos. Just south of Glenbrook, it’s near to picnic areas and walking tracks. Mill Creek campground offers sites for small caravans, campervans, camper trailers and tents. Nestled among trees and surrounded by dramatic sandstone cliffs, this sheltered area makes a great weekend escape. Small and secluded, this camping spot is perfect for weekend getaways, with easy access walks and a nearby lagoon at the beach where the kids can make a splash. Discover Putty Beach campground in Bouddi National Park for your next camping trip. This great central coast campground is a top spot to fish, swim or bushwalk. Camp at Tallow Beach campground, near Killcare on the Central Coast. You’ll find swimming, surfing and fishing spots just steps from your tent, along with walking tracks. Get the kids out of town for an adventure at Mountain Arm campground. Set near a shallow creek, it offers mountain biking and hiking. Discover some of Sydney's most secluded campsites at Kingfisher Pool campground in Heathcote National Park. As well as camping, it's great for swimming and hiking. Discover Lake Eckersley campground in Sydney's Heathcote National Park. As well as camping, it's ideal for swimming and bushwalking. Wake up with the waves at Little Beach campground, near Gosford on the NSW Central Coast. 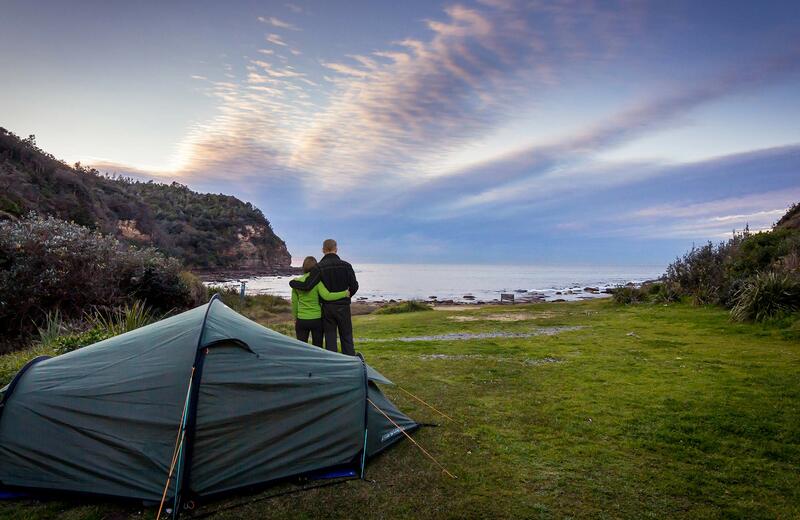 You can go surfing, bushwalking or fishing while camping right by the sand. Discover Mirang Pool campground in Sydney's Heathcote National Park. As well as campsites, you'll find opportunities for swimming and hiking. If you’re looking for things to do south of Sydney, Uloola Falls campground is a great getaway offering camping, walking and cycling in Royal National Park. Tandara is Sydney's most luxurious camping experience. Located near Lane Cove National Park, it's a great place for glamping and a romantic weekend getaway. High-end. Park entry fees apply. The caravan park at Lane Cove Holiday Park offers tent, campervan, motorhome or caravan camping in a campground with great facilities near Lane Cove National Park, close to Sydney. Escape the hustle and bustle of the city, and enjoy a getaway at these cosy cottages right on Sydney’s doorstep.